Sometimes called Star Pine, Triangle Tree or Living Christmas tree, this native of the South Pacific is ancient, if not actually a pine. Hailing from the earth’s Jurassic and Cretaceous periods, the species has proved hearty and adaptable, standing up well to wind and salt air. Children love to collect its soft awl-shaped leaves. 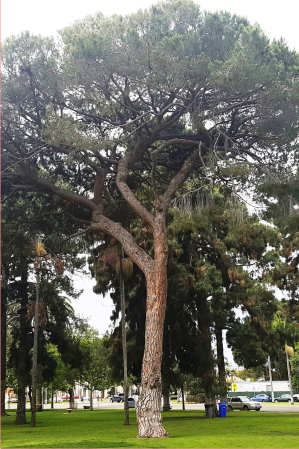 Through over 45 years of concerts no attendees have been more loyal or visible than the trees of Spreckels Park. Standing silent sentinel, these soaring companions provide shade, color and definition to an intimate experience shared by thousands. They weren’t always here. With no native trees, our peninsula was originally covered with beach grasses and coastal sage scrub from the Tijuana River Estuary to Spanish Bight and beyond. During the late 1800s and early 1900s, the park’s first lawns and trees were planted and sustained to maturity by crews that hand irrigated using water hauled in on tanker trucks. In 1915 a sprinkler system was installed. Today, Coronado seeks a balance of open space and cover from more than 100 species of trees. 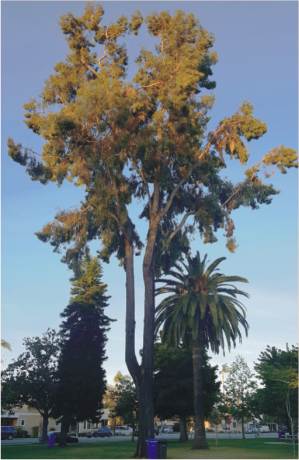 Since last year’s concert series we have lost a few of our most senior trees, which presented significant threats to public safety. They have been replaced by a handful of juvenile trees to ensure that our music will always enjoy leafy accompaniment and our lawns will always have room for our blankets and chairs. The Torrey Pine is the only San Diego County native tree in the park and also one of the world’s most rare pines. In the early 20th Century there were only 100 members of the species, which is native to Pacific-facing bluffs north of La Jolla and to Santa Rosa Island off Santa Barbara. 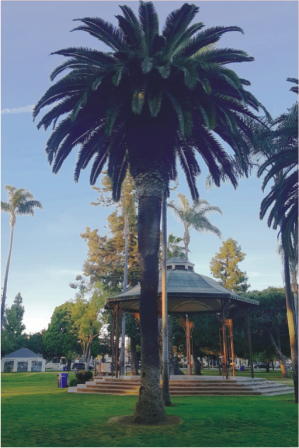 Specimens of this majestic and massive palm can be found throughout the park and around town. 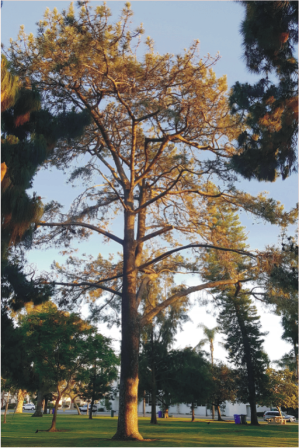 Once a popular residential landscape tree, its Coronado population is diminishing because of the significant footprint it demands of a homeowner. The most massive and perhaps most iconic of trees in the park, the Sugar Gum population has nonetheless declined. Late last year, two of the trees were removed after one dropped a seven-ton branch without warning. The removed trees were directly adjacent to the park’s playground. 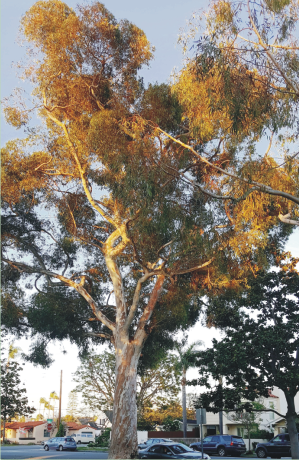 Less known or well-recognized than the Sugar Gum eucalyptus, the Ironbark’s dark furrowed bark accumulates on the tree, providing protection from fire and pests. In its native Australia, the tree is an important source for honey production and its wood yields high quality timber, especially suitable for archery bows. Also called parasol or umbrella pine, this Mediterranean native is found commonly through Southern Europe and the coastal Middle East. It casts a stately profile with its high dome of branches holding long flexible needles. It was a symbol of ancient Rome, which lined many of its roads with stands of the tree. Also known as blue jacaranda, black poui or the fern tree, this subtropical South American native is cultivated in frost-free regions worldwide. 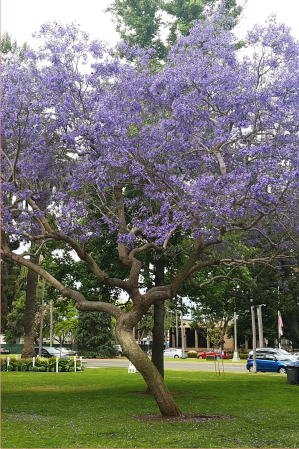 Treasured for brilliant spring color both on branches and blanketing the ground beneath its canopy, the jacarandas of Spreckles Park generally provide a showy display for the start of our concert season.